We see all types of shaft seal systems working on various mega-yachts including this Kobelco Eagle product out of a 130′ Alloy. 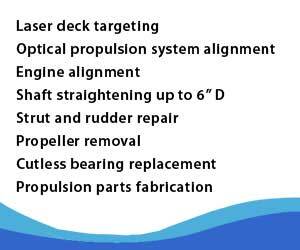 The vessel is in the yard for updating in many areas and we were given the opportunity to pull the shafts to check for engine and strut alignments. The Kobelco Eagle shaft seal system includes an inflatable seal in the body. This seal operates similar to the emergency shaft seal bladder system found in Wartsila seals. The prior post also included a video showing how the system works. If there is a need to change the shaft lip seal, or another emergency occurs, air is injected into the port and the rubber element acts like a bicycle tire inflating around the shaft and sealing off most of the water. The system is designed for emergencies only and the shaft cannot rotate while the seal is inflated. 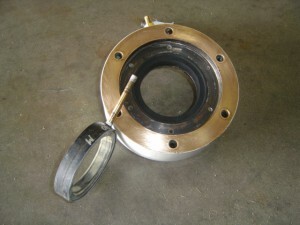 In this picture you can see the old inflatable seal with a brass air tube removed from the seal housing. The replacement seal is already in place and the new tube is coming through the housing in the top of the picture. Stay tuned for an updated post on the Kobelco-Eagle replacement lip seals.